Autumn is finally here, these are a few ways to change up your home to fit the season. Really long time, no talk. A whole season has passed since I last properly blogged, apologies for that. However, I am back just in time for my absolute favourite season: Autumn. Blogger cliche right? Absolutely but can you beat layering clothes, lighting candles, pumpkin spiced lattes, crunching leaves and the general cosiness of Autumn? Not at all. Plus, as I am a self-confessed serial furniture shuffler and home faffer - it’s just another excuse to change up my home. So I thought I would have a little chat about how you can (& how I have) updated my home for this glorious season. I’m not sure about you but when the Autumn/Winter seasons roll around I get a little more social, I like to have people round for food and drinks, a lot. 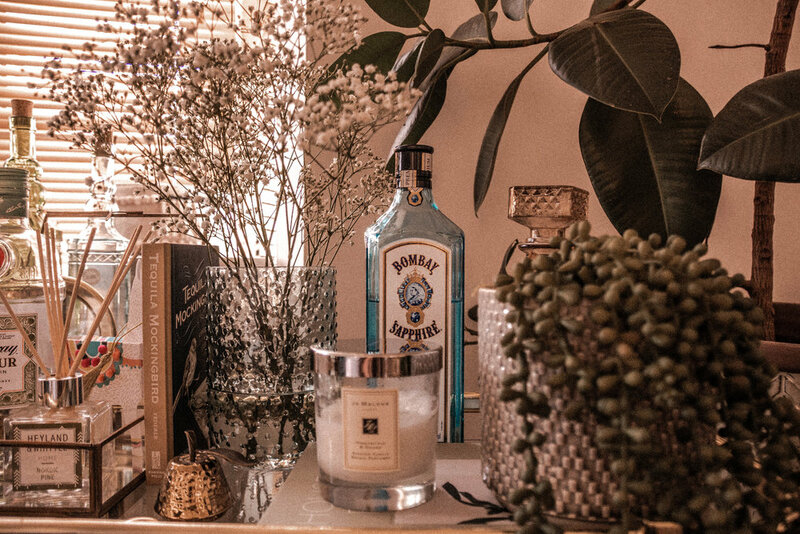 Last year inspired by Instagram/Pinterest bar cart areas I made a little spot in my lounge on a cabinet where I could keep my nice looking bottles of gin and all the fancy things that go with it. This year however my parents bought me a bar cart from Wayfair for my birthday (how well do they know me?!) so now I have a slightly bigger dedicated area. Either way, having a space for drinking bits and pieces is a must if you’re a bit of a host or you just like a tipple on a Friday night over Netflix, I mean who doesn’t? The great thing about these spaces is that they’re fun to rejig around each season (or each month if you’re obsessed like myself). Autumn is the perfect time for a switch up, get your spiced gins out, gold coloured accessories and of course Autumnal florals in a vase. 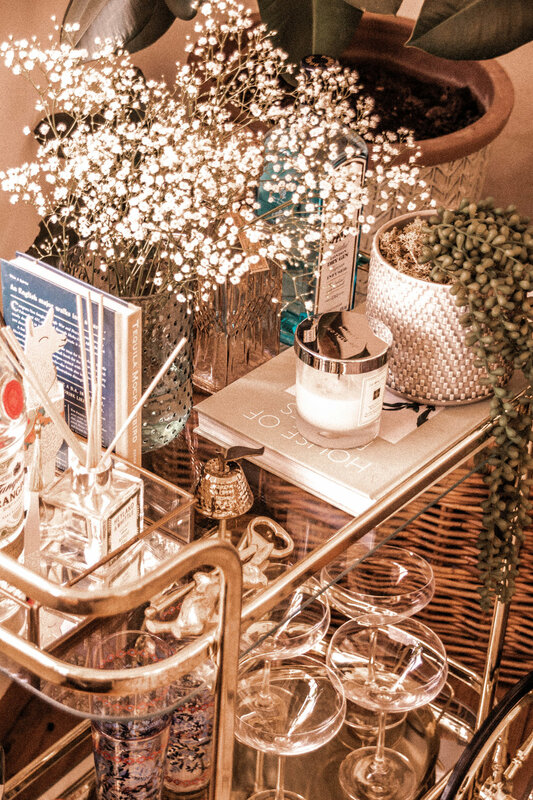 Home scents are such a personal thing but, I think most of us can agree it’s nice to swap them up seasonally. 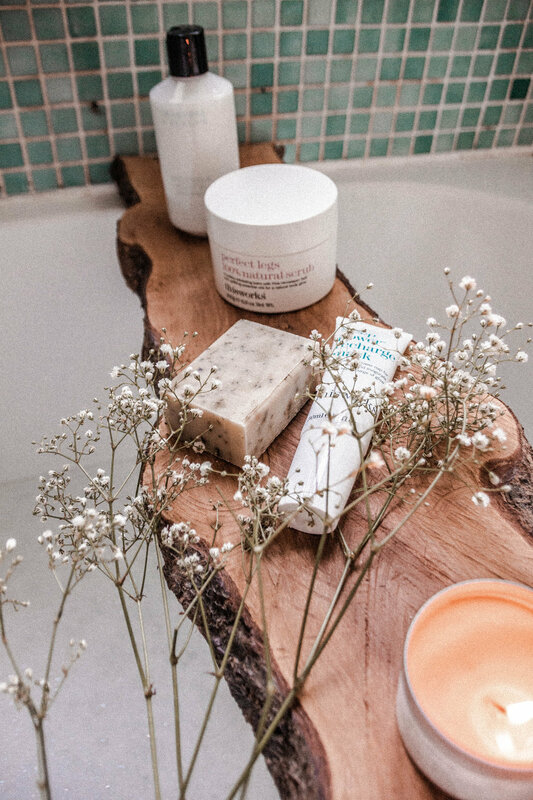 Whilst Spring and Summer might bring those gentle floral hints in, Autumn and Winter certainly make you want to seek out those warming, woody and spicy scents out. For me Autumn is Pomegranate Noir - Jo Malone - you’ll find me adorning my home with it as well as spritzing myself with it. However, this year I have a few other contenders in the mix. The new Jo Malone Honeysuckle & Davana* is a sweet but surprisingly autumnal scent for the home. Since receiving it I have been burning it non-stop and it really does leave a last scent in the lounge. Another scent I have been a little obsessed with, however a little early (I did try and save it, honest!) is the Heyland and Whittle Winter Spice*. It’s everything you want in a winter candle, spicy, musky and perfect. Have a browse around and stock up, some of my other favourite places to find candles are: OHROS, The White Company and Wax & Wick. First things first, Autumn is home to golden leaves and the beautiful pumpkin. Why leave these beauties outside when you could adorn your home with them? Pumpkins and squashes are such a cheap way to add a little autumn into your home, they make for the best kind of autumnal cooking too. Head down to your local farm shop, or pumpkin patch pick up a variation of colours and sizes. As with any kind of home styling a variation of textures and colours really adds to the definition of the room. As for styling? Find a basket, or line them up on the mantal piece - if there’s space there’s a place for pumpkins - am I right? This Works Sleep Power Recharge Mask* - this mask is like a firm but friendly pep talk for your skin, twenty minutes with this friend on and you have yourself some bright skin. Heyland and Whittle Herbal Mint Soap* - again this one really zings your skin into a fresh start, also the thing I’ve really been taken aback by with Heyland & Whittle is their commitment to less waste - you can have this soap beautifully boxed or you can choose to have it wrapped in a small bit of paper (& you save 25p)! This Works Perfect Legs Scrub* - If I could choose only one bath product to use for the rest of my life, it would be this. It is the perfect forumla to keep your legs glowing post summer skin. It is truly glorious. how do you switch up your home for autumn? Thanks for reading, see you next Sunday!